Globally, this particular LNG project is a very significant, large and technically complex, energy development. In essence, the project is ingenuity at its best. Innovative technologies have been used where possible to deliver this project and ensure that once in operation, it continues to run with little to no downtime. Located about 220km offshore Western Australia, the field represents the largest discovery of hydrocarbon liquids in Australia in 40 years. This LNG project is currently in construction and is ranked among the most significant oil and gas projects in the world. It is effectively three mega-projects rolled into one, involving some of the largest offshore facilities in the industry, a state-of-the-art onshore processing facility and an 890km pipeline uniting them for an operational life of at least 40 years. In operation, it is expected to produce at capacity up to approximately 8.9 million tonnes of LNG per annum and 1.6 million tonnes of LPG per annum, in addition to about 100,000 barrels of condensate per day at peak. A Final Investment Decision was reached in 2012 and first production is scheduled to commence towards the end of 2018/beginning of 2019. The construction work for the offshore facilities was carried out at a shipyard with the responsible classification society. Offshore facilities consist of a CPF (Central Processing Facility) and an FPSO (Floating Production Storage Offloading). On the CPF there are several risers and riser guide tubes that will be placed around the facility. Due to the size of the columns, they need housings to ensure alignment. There have been concerns that movement of the columns against the housings will cause erosion-corrosion and impact. As the CPF has a design life of 40 years, it was decided to protect the columns and housings with composite bearings. Composite bearings are generally installed around propulsion areas on ships. There are several ways to install bearings, however once they reach a certain size, the best option is bonding. Due to the size of the bearing required, in this case bonding was the only option to choose. Belzona has vast experience bonding composite bearings, especially around rudder pintle areas on ships. After a trial ship application in 1979, the material was accepted as a permanent installation and used from new on all Germanisher Lloyd classed vessels. One of the first and perhaps most notable bearing bonding applications in service today was performed on a flagship liner, Queen Elizabeth 2. Bearing bonding is carried out by injecting the Belzona material between the bearing and the housing. 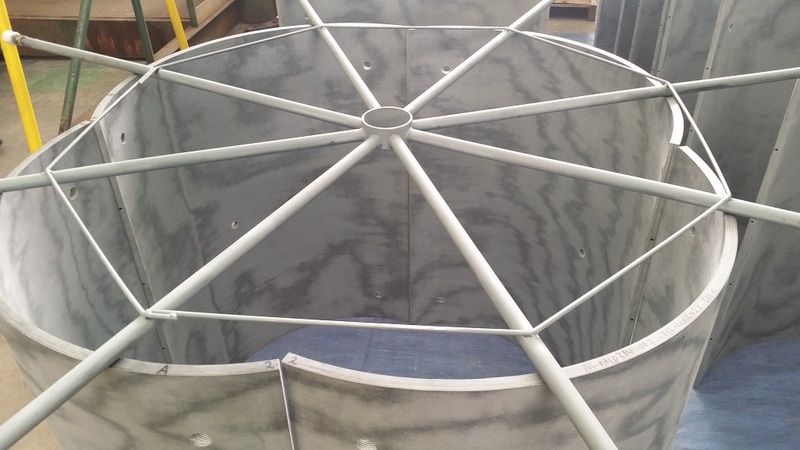 The Belzona shim takes up any ovality or housing wear, thus creating a durable barrier with 100% surface contact, electrically isolating the bearing. 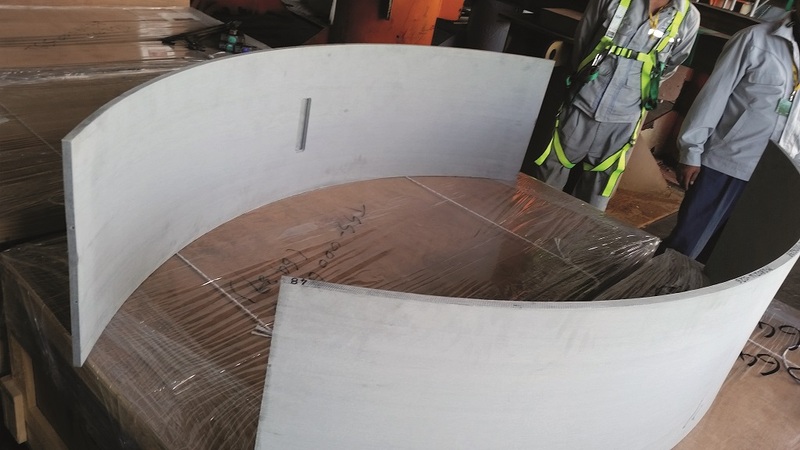 There are other adhesive products available on the market, however due to the 40-year design life, Belzona was chosen due to impressive testing, case histories. The company holds a certification for the products that are used in this process. 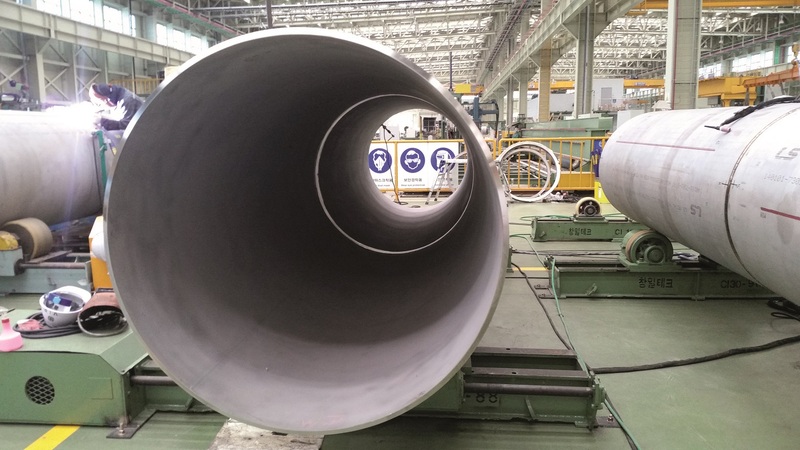 The bearings were supplied in various sizes to match the columns and housings; some of the bearings reached 2.5m in diameter and 3m in length. As the sizes were so large, the bearings were split into sections. This meant that once the bearings were in place, the seams between each section would have to be dammed to stop the injected adhesive from leaking. Belzona 1321 (Ceramic S-Metal) was used as the adhesive to inject between the housings/columns and the bearings. As Belzona 1321 does not cure based on a high exotherm, unlike chocking compounds, the gap could be reduced between bearing and substrate. This reduction of product quantity and application time ultimately saves on costs to all. 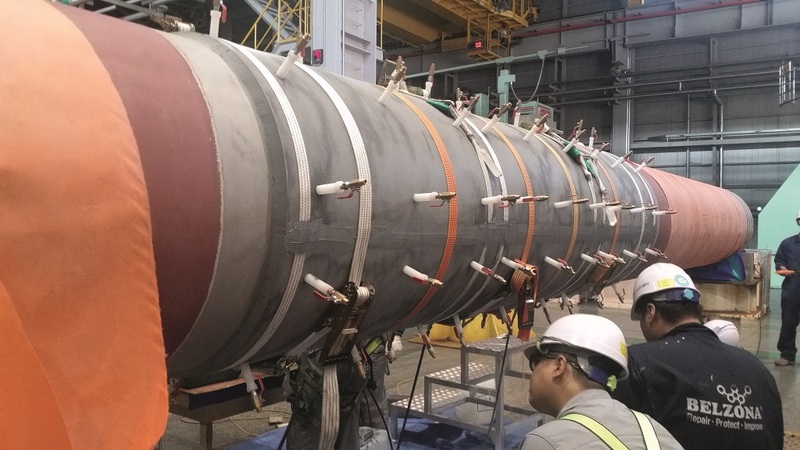 Due to the scale of this application, specialised techniques were created by Belzona Asia Pacific staff and the application team were trained up on life-sized equipment. One of the new techniques adopted was the use of a nylon jacking bolt which doubled up as an injection port for the Belzona 1321. This saved on the amount of holes that needed to be drilled into the composite bearing. Belzona inspectors were present during the whole application in Geoje and ensured that the high standards were kept through use of QA/QC documentation. This LNG project is now nearing completion, scheduled to go in production towards the end of 2018/ beginning of 2019. This project has truly been a testament to modern engineering and it will not be long before it commences its 40-year life, bringing much needed resources and infrastructure to the local and global community.